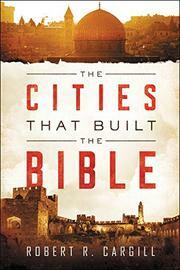 A lighthearted exploration of the history of the Bible, as seen through cities key to its development. Cargill (Classics and Religious Studies/Univ. of Iowa), who has appeared on numerous TV documentaries, takes a populist approach to this history of the Bible. Never hesitating to use a pun, tell a personal story, or make a pop-culture reference (“If this sounds a lot like the plot of Mike Myers’s So I Married an Axe Murderer…”), the author writes for the masses, and it is intermittently entertaining; sometimes, though, it becomes annoying. Cargill’s approach toward explaining the history of the Bible makes sense. He sets out to introduce readers to a dozen cities that were formative in the stories behind, the writing of, or the later understanding of the Old and New Testaments. Beginning with the etymology of “Bible” as stemming from the Phoenician city of Byblos, the author dives into a chapter-by-chapter account of various cities and how they shaped the text of the Bible. At times, that role was through historical events. For instance, Jerusalem was the site of a number of stories in both the Old and New Testaments. In other cases, the role is indirect, as is the case with Ugarit, a city that gives us deeper understanding into the many ancient gods worshiped primarily by non-Jews and discussed throughout the Old Testament. Finally, there are cities that influenced our reading of the Bible—e.g., Alexandria, whose library preserved many texts from the same time period as the Bible, or Qumran, whose Dead Sea Scrolls gave us fresh insights into how Jews lived in connection with their texts in a particular ancient era. Cargill’s exploration of the role of cities is certainly intriguing and could be greatly expanded and deepened. A solid concept led astray by the perceived need to entertain the masses, à la the History Channel.